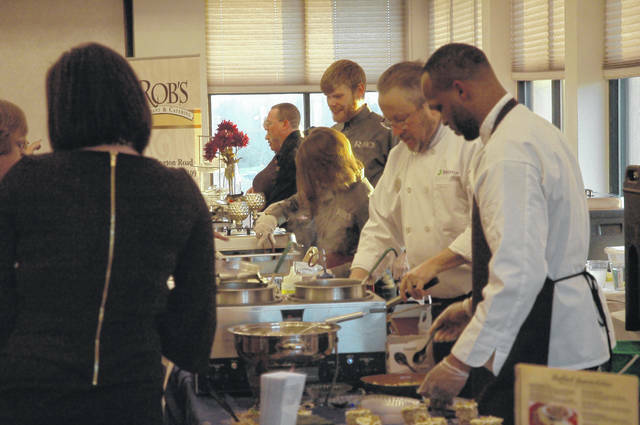 Last year a crowd of 300 enjoyed “tastes” from several local restaurants and caterers throughout the Northmont community. 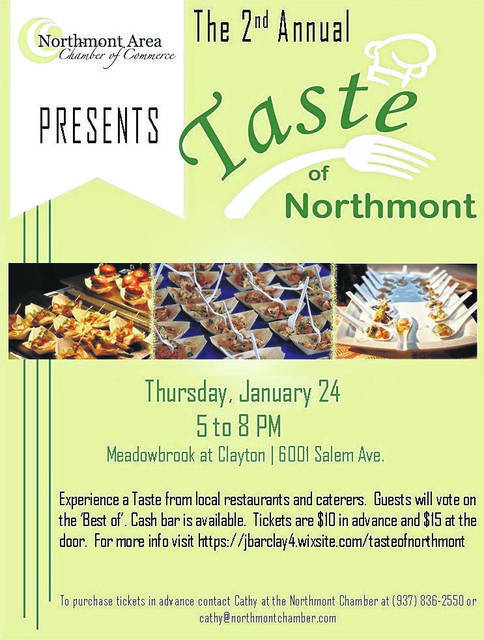 CLAYTON — The Northmont Area Chamber of Commerce is hosting its 2nd Annual Taste of Northmont on Thursday, January 24 from 5-8 p.m. at Meadowbrook at Clayton, 6001 Salem Ave.
Last year a crowd of 300 enjoyed “tastes” from several local restaurants and caterers throughout the Northmont community. Guests will once again be able to vote on the “Best of” Appetizer, Entrée, Dessert and Drink at this year’s event. Last year the cash bar was also kept busy throughout the evening and Heidelberg Distributing Company and Warped Wing Brewing Company will be returning again this year, offering beer and wine respectively at the cash bar, in addition to the Grill at Meadowbrook opening for guests looking for mixed beverage options as well. This year new traditions are also being added with the new Basket Raffle and a local DJ serving as the master of ceremonies. 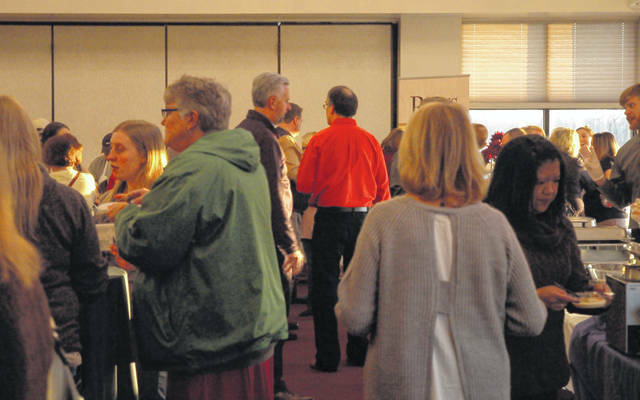 There has been an increase in the number of vendors this year and they include Mila’s Suburban Café, Ray’s Wine Spirits Grill, Boston Stoker, Rob’s Restaurant, Stonehouse Sweets, La Fiesta, Bolt’s Sport Café, Brookdale Senior Living Solutions chefs, Meadowbrook Catering, Arby’s, Sam’s Club, Mike Lang Another Pint Please and Longhorn Steakhouse. There are also several additional local restaurants planning on joining by the time of the event. After the great success of last year’s event, the Northmont Chamber and Meadowbrook at Clayton is opening the entire event facility in anticipation of another large crowd. Finally, every paid ticket holder will be able to test the new indoor golf simulators located downstairs at Meadowbrook at Clayton throughout the evening’s event. Grab a friend and join us for another fantastic night out in the Northmont Community. Last years ‘Best of’ winners won a free one-year membership to the Chamber. The 2018 winners were: Appetizer & Entrée – LaFiesta; Dessert – Stone House Sweets. The Taste would not be possible without the Chamber generous sponsors which include returning Gold Sponsor: Gudorf Law Group and new Gold Sponsor: Kindred Funeral Home. Silver Sponsors: Code Credit Union, BrookHaven Retirement Community, Meadowbrook Catering, Vitangeli Dental, Meadowbrook at Clayton, Interlink Advantage and the Englewood Independent. Bronze Sponsors: Western Ohio Graphics, Northmont Town Money Saver, City of Clayton, and FM Bank. Tickets for the Taste are only $10 in advance and $15 at the door. Tickets holders will be able taste the unlimited supply of samples of all the great culinary favorites from within the Northmont community. To purchase tickets in advance contact Cathy with the Chamber or visit the City of Clayton, Ray’s Wine Spirits Grill, Kindred Funeral Home, and Mila’s Suburban Café, all of which are selling tickets on behalf of the Chamber. To learn more about this event visit the Taste website at http://bit.ly/2COrCD0 or call Cathy Hutton at 937-836-2550.